In the non-canonical Superman #300 comic book, the Apollo–Soyuz astronauts and cosmonauts see an unidentified flying object (Kal-El's spacecraft) approaching Earth, then the US and the USSR race to the capsule to take it in their nation. ^ "The First Dryden-Blagonravov Agreement - 1962". NASA History Series. NASA. Retrieved 14 March 2019. ^ Jones, Phillip. "Blast-off to Bognor". Retrieved 4 May 2011. ^ Edward Clinton Ezell; Linda Neuman Ezell (1978). 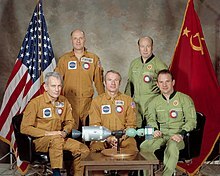 "The Partnership: A History of the Apollo-Soyuz Test Project". NASA. Archived from the original on May 24, 2011. Retrieved 4 May 2011. ^ Ezell, Edward Clinton; Ezell, Linda Neuman (1978). "The Partnership: A History of the Apollo–Soyuz Test Project". NASA History Series. NASA (NASA Special Publication-4209). Archived from the original on 2007-08-23. Retrieved 2009-03-17. ^ U.S.-Soviet Cooperation in Space (PDF) (Report). US Congress, Office of Technology Assessment. July 1985. pp. 80–81. Retrieved 13 June 2018. ^ a b Kellie Morgan (15 July 2015). "How historic handshake in space brought superpowers closer". CNN. Retrieved 13 June 2018. 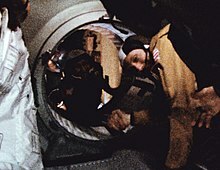 ^ a b "Apollo–Soyuz: A cold war handshake in space, 40 years on". New Scientist. 17 July 2015. Retrieved 13 June 2018. This page was last edited on 12 April 2019, at 20:12 (UTC).